The first time (there’s been two…) my PBS TV series director saw me cry, it was over a Mexican hot dog. We were filming for Season 3 in Morelia, the capital of the state of Michoacán. We had heard from many locals that the best Mexican-style hot dogs in the city were the ones at Richard’s. You shouldn’t be surprised about Mexican-style hot dogs in the Mexican culinary repertoire. We love our hot dogs! In every city or town in Mexico, no matter how small or big, a few feet away from the top-selling taco stand, you are likely to find a top-selling hot dog stand. And once you try one, I bet that’s how you will want to prepare them in the future. So anyway, we headed to Richard’s to meet him, film how he makes his hot dogs and try them. When we travel, I can’t help but share the food I love with my production team. I ask the sound guy, Dave, to take a bite, hoping he understands why I moan so much… I ask the camera guy, James, to take a bite too, so he can see why I keep on insisting that things are this or that good… The same goes for the director, Dan, the producer, Allie, and, well, pretty much everyone on board. If I taste something magnificent, I really want to share it with my team, mostly because I want them to experience it along with me. But this time it was different. We got to Richard’s, he was super friendly, and he made an insane hot dog. Different from usual, I was not sharing a single bite with anyone and was very quiet. Not my normal self for sure. To the point that the director started asking, “Hey Pati, are you ok…?” And “why aren’t you showing it to camera,” and “…do you want to give James or Dave a bite?” I was zoned out. I was just shaking my head and eating the hot dog, so very slowly. See, Mexican hot dogs and I go a long way back, as most Mexicans I guess. But in my case, rewind like 30 years ago. I was a girl, and my oldest sister started driving my sisters and me to school. Enjoying our newly found freedom, we started stopping at El Galán hot dog stand on our way back home. Though our intention was to have just one, it ended up being at least two or three. And, con todo, with all the trimmings. El Galán translates to dreamboat or a hunk, which he was not, but his hot dogs were to die for. He would drizzle some oil on his hot plancha, or griddle, and throw on some chopped white onions, pickled jalapeños, and tomatoes. Then, as they sizzled, he’d squirt on some yellow mustard and ketchup with a secret sweet ingredient (we later found out it was orange soda!) and mix everything up. Onto that delicious mess, he threw a slice of American cheese and, once it melted, he piled everything onto a soft bun and topped it with a steaming turkey hot dog wrapped in crisp bacon. If you wanted your hot dog extra especial, a couple more crispy bacon slices would also show up at the party. Then we would head home. Once there, we weren’t that hungry anymore. Once my dad figured out our shenanigans, he took out a $100 MN pesos bill, gave it to my oldest sister and announced that since we weren’t eating my mom’s planned home made meals, we were to eat at El Galán every day for that month. We were delighted to hear that, though we really tried not to show it… Now, I know what it feels like to be a parent that takes a disciplining measure that does nothing but fail, and then doesn’t know how to take it back. In any case, we soon stopped going every day and left that hot dog rendez vous for Fridays, not to make my mom sad. It was a truly special time in our lives. And I am telling you those hot dogs were INSANE. Then life happened. Then our parents divorced. Then we grew up. Here is the recipe as good as I remember it, minus the orange soda which I find to be really not necessary. Do try it at home! p.s. Oh… pictured to the left of the dreamboat hot dog is a hot dog del mercado or market style hot dog, which is also phenomenal, and it is included in my new cookbook Mexican Today. On a cutting board, roll one slice of bacon around each hot dog. Place the tip of the hot dog over one end of the bacon slice, then roll the sau-sage around and around on the diagonal so that the bacon wraps around it and covers it entirely. If you get to the end of the hot dog and there is still some bacon left, roll back in the other direction until the whole strip of bacon is rolled around the hot dog. Heat a large skillet over medium heat. Add the bacon-wrapped hot dogs and cook, turning every 2 to 3 minutes, until crisped and browned on all sides. Remove from the heat. To make the salsa especial, heat the oil in a medium skillet over medi-um heat. Add the onion and cook, stirring occasionally, until it is tender and the edges are beginning to brown, 5 to 6 minutes. Stir in the tomato and cook for another minute or so, until the tomato has softened a bit. Stir in the jalapeños, ketchup, and mustard and cook just until heated through, about 1 minute. Remove from the heat. Preheat the oven or a toaster oven to 350 degrees. Open the buns but try not to separate the tops from the bottoms. Top the bottom or both halves (to taste) with cheese (break up the cheese if desired) and place on a baking sheet. Bake for 2 to 3 minutes, until the cheese has melted and the buns are lightly toasted. 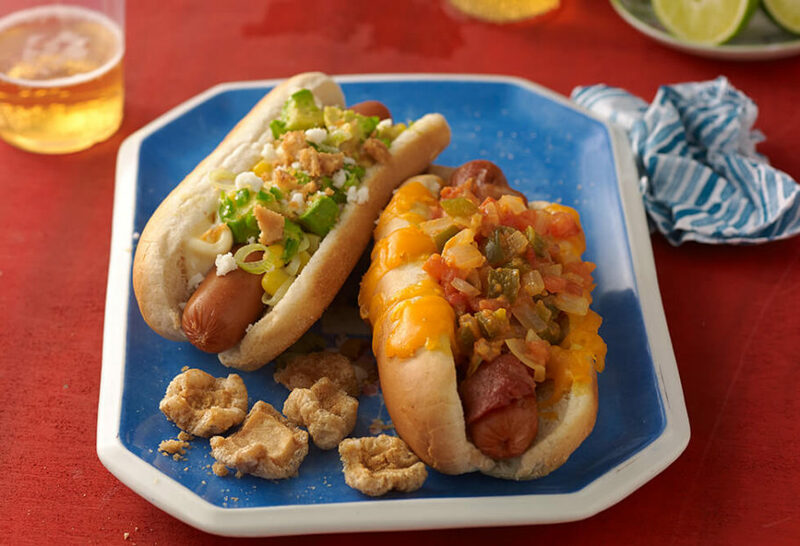 Place a bacon-wrapped hot dog on the bottom half of each bun and top with a generous amount of salsa especial. Cover with the top halves and serve right away. Que hermoso es cuando con una comida te transportas a una epoca fé tu niñes o tu vida😊😊 es un ingrediente majico que la comida tiene💞💞 muy Linda historia. I’m an ovolactopescatarian but if I were ever to relapse as a meat eater this would be the likely culprit! I like the one that you and Alan made where the cheese is fried crisp like Chicharrones! Che rico! Made these tonight for dinner along with your Heart of Palm Soup with Sweet Potato Croutons. Oh my gosh Pati, delicious! The salsa especial really takes these hot dogs over the top! Let’s be honest, plain hot dogs can be boring. But these hot dogs were full of flavor and definitely were a big hit for dinner. The Heart of Palm Soup is elegant, delicious and easy. The Sweet Potato Croutons were amazing and I had to stop myself from snacking on them before dinner…. Thank you so much Pati for sharing your love of Mexico, the culture and cuisine with all of us! I love watching your show and am enjoying all the recipes from your cookbooks. I live in Sonora, where people credit vendors in Hermosillo, just outside the university’s front gate, with inventing the dish. That said, the most wonderful I’ve ever had was at El Balto, a stand built on the back of a white 1949 Ford truck parked on the Alameda in Alamos, Sonora! “Con todo” included all the usual, plus chopped chicarrones and a dusting of cheese! Out of this world! Second best was from a cart in La Paz, BCS. But the truth is, they’re nearly always different and wonderful, wherever you find ’em! They all sound so yummy! And I agree, Charlie, they’re wonderful no matter where you find them :). I love the Mexican hot dog carts in the Zona Rosa in Ciudad de Mexico. Hard working guys who take great pride in their work. I had many late night conversations about the state of the world with these fine businessmen and their customers while eating their delicious hot dogs. But up in Hermosillo, Sonora the hot dog is brought to a new level wrapped bacon grilled served on a soft roll with beans chopped tomatoes and jalapeño salsa. Ricisimo!! I was recently visiting Los Angeles and downtown in the Fashion District there are street vendors that sell hot dogs similar to these, and I can’t go to LA without having one! They are bacon-wrapped with grilled onions and bell peppers and then topped with pico de gallo and diced avocado. My mouth waters just looking at yours and thinking of the ones in LA. On a different topic, when I watched your show that was taped in San Miguel de Allende it made me want to visit there so badly. My family has decided to spend Christmas there this year, and we want to take a cooking class or two while we are there. Do you have any recommendations of some and also of your favorite restaurants there? Thanks so much for any help and also for having such a wonderful show! I never miss an episode! A great example of a (sometimes borderline) American food being elevated by “foreign” 🙂 influence. I can’t remember having a bacon wrapped dog until Mexican street vendors starting selling them here in L.A. at least twenty years ago. Until then, bor-ing …. When my Massachusetts-born, Maine-living soon-to-be-husband and I were dating (I was born and raised in Southern California), he took me out to a local “Mexican” restaurant in Maine — the quotes are there on purpose. I tried to be enthusiastic when he asked me about it, but found it hard to accomplish given that it was typical east-coast “gringo” food. Soon after we were married, however, we decamped for an academic posting in Des Moines, Iowa. One of my new colleagues told me that on the east side of Des Moines was a barrio that had been there since the early 1900s that sported several good restaurants. So, one Sunday morning I took my new hubby for a Mexican breakfast and ordered him huevos con chorizo, full of minced onions, peppers, and tomatoes, accompanied by “morning salsa” and home-made tortillas. On taking one bite, hubby burst into tears, crying, “This is the best thing I’ve ever eaten!” On further reflection, it wasn’t *just* the food: the Mexican accents, the homey atmosphere, the concern with good food, all reminded him of his long-dead Italian-born maternal grandparents. Taste, as well as smell, evokes memories powerfully. Pati, Lsos carritos con “perros calientes” estaban siempre a la salida de los cines en la capital. Ya llovió desde luege, esto ocurria en los años que vivi en el DF. A mi también ya me llovió! Wow! My mother-in-law taught me to prepare hot dogs in a similar way but instead of bacon wrap she used a small amount of bacon grease in an iron skillet and sautéd the hot dogs slowly until well done and a little bit crispy on the outside. The rest is much like your recipe with cheese, onions, and chili. Can’t wait to try your bacon wrapped hot dog and especially the jalapeños and tomatoes. THAT way sounds divine! I will have to try it! Thank you Debbie! I saw you prepare these on The Chew and they looked fabulous! Really brightens up the whole hot dog experience with some fresh and fun flavor! I am really enjoying your cookbooks! Thanks Pati! Yay!! Thank you so much Patte. I’m thrilled you like the books! How nice. Isn’t it funny how so many memories are triggered by the foods we eat. The smell, the taste, the routine. Our family ‘standard’ was a dish called slumgullium. It was actually just elbow macaroni noodles with sauce (or soup if necessary) and whatever else mom could come up with. And, depending on how the budget went for the week, we might have ground beef with it, and on a good week, cheese! Usually, though, it was just macaroni and sauce that mom would season up. We all loved it with bread and butter. But most important was making sure there was enough for the next day. The following day, after it chilled overnight, we would make slumgullium sandwiches! Those were the best. I’m not sure it ever made me cry, but one thing I always thought of when I was away from home in the Navy, was slumgullium. I make it now,, and my boys all love it, but for some reason, and you probably can relate, it never tastes quite as good and when mom made it. I can totally relate, Michael. Dreamboat hot dogs is right! I’ve been making them for guests for a couple of months now and the consensus is: “¡OLE!” And a perfect way to begin the evening is with Pati’s Rustic Corn Guacamole which is everyone’s new favorite. One question: why did you choose to leave the orange soda out? Not that I’m putting any pressure on you, Pati, but when is your next book going to come out??? Thank you for trying it, Anne!